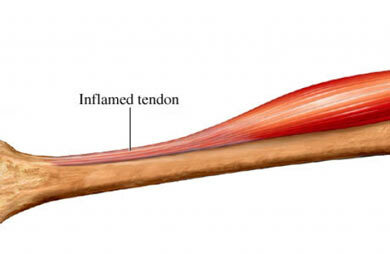 Tendinopathy is caused by overuse of a muscle-tendon unit. The strain on the tendon causes tiny tears that build up over time. There can also be inflammation. These tears cause pain and can eventually change the structure of the tendon. Restricting activities. Normal activities will be reintroduced gradually. Prescription or over-the-counter medication may be advised to reduce pain. Cortisone injections may be used if other treatments do not alleviate pain. Derry S, Moore RA, Gaskell H, McIntyre M, Wiffen PJ. Topical NSAIDs for acute musculoskeletal pain in adults. Cochrane Database of Syst Rev. 2015;(6): CD007402. Exercise-induced leg pain. American College of Sports Medicine website. Available at: http://www.acsm.org/public-information/sportsmedicinebasics/exercise-induced-leg-pain. Accessed February 22, 2018. Patellar tendinopathy. EBSCO DynaMed Plus website. Available at: http://www.dynamed.com/topics/dmp~AN~T115369/Patellar-tendinopathy . Updated December 22, 2015. Accessed February 22, 2018. Patellar tendon tear. Ortho Info—American Academy of Orthopaedic Surgeons website. Available at: http://orthoinfo.aaos.org/topic.cfm?topic=A00512. Updated February 2016. Accessed February 22, 2018. 10/26/2010 DynaMed Plus Systematic Literature Surveillance. http://www.dynamed.com : Massey T, Derry S, et al. Topical NSAIDs for acute pain in adults. Cochrane Database Syst Rev. 2010;(6):CD007402. 4/24/2014 DynaMed Plus Systematic Literature Surveillance http://www.dynamed.com : Wise JN, Weissman BN, et al. American College of Radiology (ACR) Appropriateness Criteria for chronic foot pain. Available at: http://www.acr.org/~/media/ACR/Documents/AppCriteria/Diagnostic/ChronicFootPain.pdf. Updated 2013. Accessed March 9, 2015.